The planter with Mohammed's cherry tree in has got amazing company for a few weeks! The beautiful Irises have come up even better than last year! Thank you to all the gardening club for getting so much done over the winter - all the planters are looking great! Maybe it's the reedbeds - or maybe it was just that awful narrowboat engine leak last year - but this year the carp are back in larger numbers than ever. The Common carp (posh name - Cyprinus carpio) is a widespread freshwater fish in the waters of lakes and large rivers in Europe and Asia. Although they are very tolerant of most conditions, common carp prefer large bodies of slow or standing water and soft, vegetative sediments. A schooling fish, they prefer to be in groups of 5 or more. They naturally live in a temperate climate in fresh or slightly brackish water - which makes the Lea a perfect home for them. They normally stay all summer - so whenever you get a chance - pop up to the recycled garden - and sit still for a few minutes - and a school will be sure to come along. Fly-tipping in Leabank Square plummeted to a new low today when a pair of adolescent cats were dumped in our bin area this morning. The terrified cats were shivering from cold & fear when Tony spotted them. Thanks to Tony and Isabel who called the RSPCA - and they were speedily picked up. Please remain vigilant about these fly-tippers who keep returning to Leabank & making our lives a bit more challenging. One of the first flowers shining out of the wildflower meadow in the edible garden - is the Ox-Eye Daisy. Remember when we planned & planted up the meadow in March - we all agreed to site it here in order to attract loads of insects into the edible garden. Of course - the fact that it welcomes us into Leabank Square - right at the entrance - is a great benefit as well. The ox-eye daisy is a typical meadow flower, growing in a variety of plant communities such as dry fields and meadows, but also under scrubs, open-canopy forests, and waste places. It thrives in a wide range of conditions and prefers heavy and damp soils. Thanks to all who have sent messages complimenting the Gardening Club on how the meadow is looking - we really appreciate it! The tongue twisting Latin name for this Angle Shades Moth is Phlogophora Meticulosa. The adults generally fly between May and October, in at least two generations, but can be found in any month. The species is also a common migrant and can occur in large numbers at coastal & river locations - hence it being on the Bank of the Lea. The angular markings provide excellent camouflage against foliage. The hindwings are whitish with darker venation. Two broods are produced each year, and in the British Isles, the adults are on the wing from May to October. This moth flies mainly at night and is attracted to light and sugar. It may often be seen during the day at rest on fences and garden foliage - or in our case - on the Recycled Gardens purple pots! It occurs throughout Britain, commonly in places, and more so in the south. The larvae feed on a variety of herbaceous plants - which is why we are all finding the bright green blighters all over our plants! Still - it is very Beautiful!! We were all treated to a lovely visit from Zena & John a few days ago - when they travelled up from Croydon to check out Leabank Square - as their daughter will be moving in soon. You will really struggle to meet a lovelier couple! They are just so full of zest for life! They brought some food along to share with us for lunch - and along with the world famous Leabank Square Salad and Nadira's delicious sea bass - a great treat was enjoyed by all! They are both so knowledgeable about plants & flowers - and were very impressed with our recycled garden. 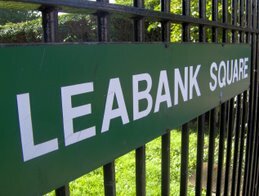 Infact, they were so impressed with Leabank Square - that they are even thinking of moving north of the Thames to here - so if anyone knows of any flats coming up for rent - please tell us -& we'll pass the details on to them. Check all these amazing fish out!! No sooner have the reedbeds been installed - than hundreds of minnows have moved in underneath them. Minnow is general term used to refer to small freshwater and saltwater fish, especially those used as bait fish or for fishing bait. More specifically, it refers to small freshwater fish of the carp family. There have been a few carp drifting by - so look out a soon-to-come entry on them. In the meantime - it seems the best time of day to see these tiny beauties is in the afternoon - for some reason. Stay in the same spot for a few minutes - and these shy minnows will soon cloud by. Wren decides to house-hunt in Leabank Square!! This may not look like much…but these pictures show the precious moment when a curious little wren decided to take a peek inside one of our riverbank bird houses’. The wren doesn't stay still for too long and so it's really quite a challenge taking a picture. By the time I had found the camera, turned it on, found the wren through the view finder and begun to take pictures... the wren was on the verge of leaving! The above shot, shows the wren poised and ready to view the house. The wren, as it enters the house! Over the cold winter months we had noticed a frequent visitor to our riverbank garden. It’s good to know that they are still visiting. About a year and half ago, we placed a few bird houses along the riverbank. We had assumed they were still unoccupied…but perhaps our shy friend has been surreptitiously raising a family right under our very noses??!! Leabank Square Riverbank Garden is now the happy host to a spanking new reed bed fringe. Many thanks to the great team who planned and installed these ingeniously designed beds. Thanks to British Waterways, Thames21 and the AGA Group for giving Leabank Square the opportunity to support such a great project. The actual reed beds consist of 2 cages – the longer top cages contain the reeds, whilst just below these, the smaller fully submerged cages provide a refuge for fish escaping predators. Stunning oak panels have been attached along the outer side of the cages, so that they appear hidden. Infact, from the towpath it will appear that the reeds are growing out of wooden planters in the water! How clever!! The reed beds are a perfect companion to our riverbank garden. The two go together like peas in a pod! Just as we have been creating an environment where nature should flourish, so too will the reed beds. The reeds will support micro organisms which in turn will support a much more diverse aquatic wildlife. In time, we’ll see greater numbers of dragonflies, frogs, newts and fish, making pond dipping sessions much more exciting!! As you can see in pic above - most of the real work takes place under the water level. There are 2 cages - the top longer cage is for the actual coir & plants. The bottom cage has slightly wider squares in the wire to enable fish, frogs & newts to hide amongst the roots if a passing cormorant should feel hungry. The solid oak plank is fixed to the front of the cage to prevent damage to the wire from barges & narrowboats. .......... and to avoid damaging any of your seedlings - they worked from in the canal in front of the nursery. This is just 1 of 4 separate deliveries that came into Leabank Square. When you look down onto the reedbeds - you have no idea just how much kit has gone into making these amazing fish habitats & reedbeds - but it needed loads of stuff delivered! This is the view from above - with very little clue as to what is below the surface. Soon - all the plants will have grown much higher - and we shouldn't even see the cages. There are many kinds of grasses, sedges, reeds & water flowers seeded into the coir. You really have no idea how stunning this is all going to look when it matures!! These are the first of our new visitors to the Leabank Square Reedbeds!! We counted about 50 tadpoles who have a safe brand new home! .......... and how about this beauty?! An adolescent damsel fly pays her first visit to the Recycled Garden! Many thanks to the unstoppable Chris from the Mabley Green Meadow - who delivered loads of seeds, trays, compost & pots - ready for us to start seeding stunning flowers for the meadow! If you have not yet met Chris yet - you are in for a treat. He is such a community spirited resident - who selflessly does so much for all of us in Hackney Wick. You will probably get to meet him on one of his frequent visits to the Leabank Square Nursery though! The seeds trays are all filled now - and soon you will start seeing the seedlings poking through - ready to be transplanted to Mabley Green Meadow. Martabelle.K - Fantastic Time Out Review!! Leabank Square's best loved foodies have just had a brilliant review done by Time Out! Congratulations to Martin & Isabelle on getting such a rave review. Leabank Square & Hackney Wick is so lucky to have some of the most celebrated cafe's (http://martabellek.com/), bars (http://thehackneypearl.com/) & cycle cafe's (http://theviewtube.co.uk/visit/eat.html) surrounding us! With all this great publicity - hopefully the Wick will soon become a foodie destination! Well done Isabelle & Martin!! Who can help our artichokes? Three of the plants are starting to droop quite badly in the Edible Garden. We've given them loads of water, they're in very free draining soil, they're in the sunnier northern corner, and we prepared it with a bit of Mike's manure - well - his horses manure actually last summer. Is it just this unseasonably cold snap - or are we doing something else wrong? Did anyone else notice how many more residents were voting this election than any others before?! So now - all we have to do is stay up all night to see what's going to happen. Who else thinks that we might need a few days to sort out just who's going to run the country for the next 5 years? The Leabank Square Gardeners Club was treated to an amazing concert from Tony yesterday. While everyone else brought some food along - Tony brought his guitar. Tony - thanks heaps for the incredible gig - the highlight was you own song about Portland Slate. Like you sing - we need to stop & smell the flowers every now & then. The food - as ever - was simply scrumptious - so thanks to all who brought some dishes along. The next Gardening Club meet up is next Sunday - but keep checking to see when the next lunch is.